New York Times reports that Google's plans for a service that puts you in control of your health information start to take shape. This service could help you make more informed decisions about your health, get personalized recommendations from specialists and share this information with other people. A prototype of Google Health, which the company has shown to health professionals and advisers, embodies the consumer-centered philosophy. The welcome page reads, "At Google, we feel patients should be in charge of their health information, and they should be able to grant their healthcare providers, family members, or whomever they choose, access to this information. Google Health was developed to meet this need." A presentation of screen images from the prototype - which two people who received it showed to a reporter - then has 17 other Web pages including a "health profile" for medications, conditions and allergies; a personalized "health guide" for suggested treatments, drug interactions and diet and exercise regimens; pages for sharing information, receiving reminder messages to get prescription refills or visit a doctor, and pages to access directories for nearby physicians and specialists. * Health care information matters - "Health information should be easier to access and organize, especially in ways that make it as simple as possible to find the information that is most relevant to a specific patient's needs." * How do you know you're getting the best care possible? - "There is a lot of material out there about drugs, diseases, procedures and treatments. How do you know what is trustworthy and what isn't? Search is great at finding us places with relevant information, but it is hard to know which links are reliable and which are less so." * Is there a doctor in the family? - "We have been talking to many medical experts to understand what the best guidelines are, and how we can determine which ones apply in different circumstances. If such guidelines were more available to patients, they might be able to, by inputting information such as age, gender or medications, learn about recommended screening tests and other preventive measures, or about harmful drug interactions." * Some screenshots of the prototype. While I'm sure Google has good intentions, this seems to be more trouble than it can be worth. Many websites that give medical advice also give giant disclaimers that it isn't a substitute for truly visiting a doctor, similar to how websites giving legal advice say that it isn't a substitute for truly visiting a lawyer. Sure, some of the features are nice, such as reminders to refill prescriptions and some of the tracking features, could Google be going a little to far on the back of the information superhighway? - Empowering the individual to gain a better knowledge about what is out there that he could put to use in his personal health care plan. - Empowering the individual to have the control over the memory of his health care history. Those are noble goals that could help the individual in liberating himself from the chains of serfdom woven around him by the health care market. But danger lies ahead, for, the health care market could very well impose itself at the steering wheel of such a service in exchange for the ads it will pay to Google. Individual empowerment versus market control. Google's premise was "no evil" and I understood that as "Individual empowerment against market control". Let's see how that works out. So now they know what I search for and what news I read, they read my mail, they hold my pictures, videos, documents, & spreadsheets. With their checkout product they process my credit card numbers. Now they want my blood type, pressure, weight and age? If they couldn't deduce that from all the other information they have about me, they probably need to tap my phone. What will be the next? Google Health Plan! Might work out better than now! Way too simple to be of any practical use. Google is suffering from NIHS, (the "Not Invented Here Syndrome"). They need to look at what other heathcare companies have and either buy them, or work with them. A collegue of mine mailed about this new theme for me. I`m a family physician from Spain, I work now in quality management, evaluation of services, information systems….for primary healh attention. I agree the point of view of this work line. Is good for me, to know that many others are working about this ( as explain: Bob said on Saturday, August 18, 2007 8:24:00 PM PDT). I specially read Roni Zeiger, M.D., Product Manager, Google opinion. Internet health information is abailable for everybody? How to struture this information? How to know is reliable for patient? What to “say” or not about health in web? I think is a difficult exciting task to do. Is something we must do for patients, always manteinning ethics rules. But I think that the access to one's health records is something very difficult to do, ethics and maybe technics have a lot to say about. A big “idea” for thinking next weekend! Whilst keeping the intended goal of availing information (as if doctors have been hiding it!) it is a good idea. But to be honest what new information are they going to provide that is not already available. ZIP. There is no substitute for medically trained doctors. 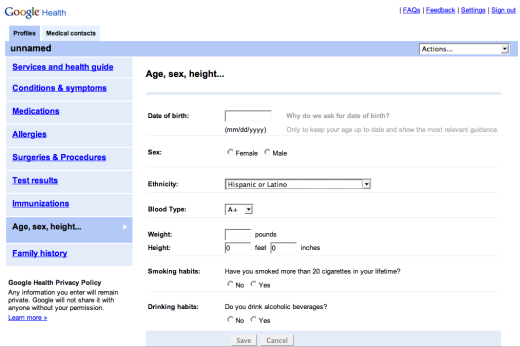 What Google is offering is really your medical history library on-line. It is erroneous to think by availing medical information people can suddenly treat themselves. All you need to do is read the drug information slip that accompanies your tablets to realize that you most of what is written is not intended for everybody. If Google think that their users all have the capacity to synthethize medical data and review their own treatment whilst sitting at home then they should quadruple their legal department and start their defence. The best Google could offer are Old wives tales about which plant or herb cures what. Another option which I recommend is for Google to spend some of its cash in hiring doctors to review the on-line data and offer appropriate advice on what the patient should do.It will be fair for patients to confront their usual doctors with the recommendations given. Needless to say only the regular doctor can should review treatment. Patients are well in their rights to stop whenever they like but at some cost. Let us not spread the wrong ideas. I rest my case. It's going to become real interesting if they offer functionality like: people with similar conditions as you have been given treatment 'X'... Could this become an early detection system for all kinds of diseases? Electronic Health records have been available from Health plans for a while with little adoption (3-7%). Efforts like this one from Google and Revolution Health (which has a very similar portal) suffer additionally from the fact that the consumer has to enter all this information and no consumer has enough time to do that!! Make it easy! Spend more time figuring out how this tool can be integrated with EMR software that is already out there and less on a ramped up portal that exists in various fashions. If you really want this to be helpful for the patient and the physician, then you need integration with EMR...not just making someone enter their own information. This is absolutely no help to the family physician or PCP if the patient doesn't share the data that's on it. What about Google Diet plan ? from the search engine to the health .. Nothing to say exept " Well a new idea!" in theory this application may become the most powerfull instrument for epidemiological and clinical research you can think of. In case it might be possible to put a specific question like "what happens clinically to people with disease X who take medication Y in a dosage of Z over a period t?" to that database (of course to anonymized patient data sets) you would get the possibility to look at thousands of patients which would give the evidence an unbelievable statistical power. If data protection could be asured by anonymization of the data and by implementation of strict restriction to the resulution of geographical information AND if that information would be free of profit to any party, it might help to evaluate and develop medical treatments thereby helping all. However, all the ifs need to be guaranteed. This is a good development. Missing from the Google and MSN systems is a way to carry private medical data. Our company www.walletex.com has the solution with a waterproof, ruggedized USB Flash Card that literally fits in your wallet next to your bank cards and driver license. No matter which system is adopted, people still need to have secure access and portability of the data. I have been registered with revolution since its inception and I always forget that it is there, unless someone asks me if I ever heard about it. I ust registered for msn healthvault. I am a health professional and boy was it confusing. I encourage Google Health to upgrade their electronic personal health record (ePHR) to include drug safety. There are two levels. First, include alerts for known adverse drug interaction. The importance of interaction alerts in computerized prescription order entry systems is well documented (eg Bates DW, Gawande AA. Improving safety with information technology. N Engl J Med. 2003;348:2526–34). Surely, such an important check would be valued by Google Health users. Second, re-invent ePHR's and use de-ID'd ePHR data, with permission and all the important security precautions, for statistical measures of drug efficacy and safety. The model for this would be quite simple: transmit ePHR on meds, morbidities, health characteristics w/ patient permission to supervised SAS-based program; data panels per characteristics provide reliable statistical measures; results transmitted back to the patient's ePHR in near real time of findings. This kind of postmarketing drug surveillance now usually takes years. I would like to add to the above comment (by me). The alert for adverse drug interactions that I contemplate differs from the Google Health. I believe the alert should be an immediate notice, a ping or the like, as soon as the drug information is entered. Once the alert notice is make, the patient can investigate with an information page. Also, I would like to emphasize the importance of accessing and pooling the ePHR data for estimating risk ratios. Two years ago I wrote a senior official at the FDA about just such a proposal; his response was that utilizing ePHR data for drug safety would be a very important development for drug safety – but FDA can't endorse or sponsor; also, don't count on academic health systems (AHS's) unless there is a big bag of money available. I contacted 2 leading drug safety authorities from AHS's and they agreed that an ePHR-based drug safety surveillance would be a significant contribution to drug safety. Also: Consider allowing patients to rate the effectiveness of drugs – I am thinking of the study that found that Celebrex (or maybe it was Vioxx) was no more effective than over-the-counter pain medications. And, I agree with the comment that suggested possible linkage to EMR's – given the standardization of coding. I think HealthVault is pushing this. Concerning Google or FDA or academic centers supplying drug safety info, I attended a conference in NYC about 12 years ago at which the CVS corporation offered online and hard copy access to physicians about their patients prescription use. They would let the physician know if the patient filled a conflicting prescription or failed to refill one that could endanger their health. They offered all this free. Guess what, no takers. The plan was scrapped. How can patients be expected to understand what all the information means, if their doctors will not even consider the value of searching for us? I believe your comment really gets to a fundamental reason for electronic patient health records (ePHR's): so patients participate to the fullest possible extent in their own health and medical process. Since, as your comment suggests, patient cannot always rely that their health care providers will ‘do no harm.' Thus, I suggested that an ePHR should have an aggressive drug interaction alert (eg IOM's To Err is Human). I also suggested an ePHR data based postmarketing drug safety surveillance to provide a layer of protection against unknown hazards of newly approved drugs (for such a need, take a look at www.worstpills.org). Of course, nothing about ePHR is worth anything if the technology isn't ‘friendly' to use. As a physician, I am frustrated by the unrealistically high expectations surrounding PHR's and how they are going to suddenly enlighten consumers to make better health care decisions. It’s high time that the PHR discourse is put into perspective. Medical records are a historical archive of clinical transactions--- intended to guide future care. Physicians invest significant time in their training learning how to create and interpret medical records and use this information for decision making. Why is it that consumers are expected to obtain similar benefits sans a medical degree? Don’t get me wrong I am fully pro-PHR. Allowing consumers’ control of this information allows them to participate in their care, but most importantly, it will make it less likely some ER doctor needs to fly blind. * Do I need to see a doctor for my symptoms? * If so, when should I get care? Now? In a few days? * Where should I go for care? Tens of millions of symptomatic consumers fumble with these important decisions every day, and with startlingly limited information. A disturbing number of studies demonstrate that we are not doing a good job because as many 40% of patients, in our already overwhelmed emergency rooms, don’t need to be there. Then there’s that other problem: people who wait---and sadly, have their heart attack or stroke at home. So how have we providers responded to all this? We have constructed urgent care clinics with the caveat that they only be used for urgent problems, but not emergencies. More recently, we have started building nurse retail clinics with the caveat that they only be used for minor conditions and some urgent care problems. In most cases this requires that you know your diagnosis before you go. Anyone lost yet? No problem at my house, like Roni Zieger MD, my family and friends, call me for advice. But like Dr. Zieger, I have to wonder, what does everyone else do? I’m not saying stop the PHR project, but I challenge every doctor and engineer out there to leverage health informatics to build some first-ever tools that support consumers in making real access-to-care decisions. Steven is to be commended for being a physician who appreciates that his patients may be able to make good decisions if the have the appropriate information. There are tools out there to help patients with such decisions, but with out support from the medical community, they have not become popular. My company has used this tag line since 1990, when I introduced it at the Public Health Physicians Assoc. convention. "When patients are given the appropriate resources, patients,providers and payers equalize expectations and outcomes." Back then, I had the idea to use a 900 telephone number for patients to call in for advice. There were some other startups around the same time doing similar work using 800 numbers. We were all shut down by the medical community's outcry that patients needed to be examined in person. Amazon.com has many copies of the American Medical Association's Encyclopedia of Medicine, which uses a symptom approach to prioritizing care, for less than 5 dollars, including shipping. Another effort that came and went was the offer for free televisions with medical programing in the waiting room, in exchange for a few pharmacy ads being used after each program. Now, our offices use an interactive program to prioritize patient care using Google searches to educate our patients. We don't have to reinvent the wheel, we just need a commitment from physicians to use and recommend the resources that are out there. This is the new role that doctors can take to get out from under the managed care industry. WHY GOOGLE WHEN YOU HAVE WEBMD? Web MD is a content provider. They only have the information they have decided is important. I google various phrases, such as symptoms to see everything there is out there on a particular topic. I can see support groups, alternative treatments and products and also local providers if I add a zip code. I may find books on the subject or even blogs from fellow patients. I do use Medscape to search for specific drugs and conditions, but that is very technical and may not be appropriate for patients. is there a way or a need for doctors to see how other doctors treated a particular case? For example, a doctor Z treated a condition Y with a drug X for a period of time. He also published why he used the particular drug X. If another doctor A comes up with a similar case and he comes across this information that Doctor Z used, would it help this other doctor A to first understand why doctor Z made his choice and then decide whether to approach it with the same thinking? Of course, all this assumes that there is real data available in the form of EMR and patient personal data is masked. The question is "Is there a need?" The delay of the release of the Merk/Schering-Plough sponsored study of Vytorin by 19 months after completion (April 2006) illustrates just how incredibly important an eHealth drug safety surveillance program would be to protect the public from opportunistic (and shameless) pharma. This industry sponsored study showed (at least) that Vytorin was no more effective than generic substitutes. What if GoogleHealth took the initiative to create a link to a clean-hands eHealth surveillance for tracking drug postmarketing performance (not hard at all to set up w/ cooperative agreement w/ academic sponsors)? How many lives would be saved? Think about how GoogleHealth would be held up as the gold-standard. 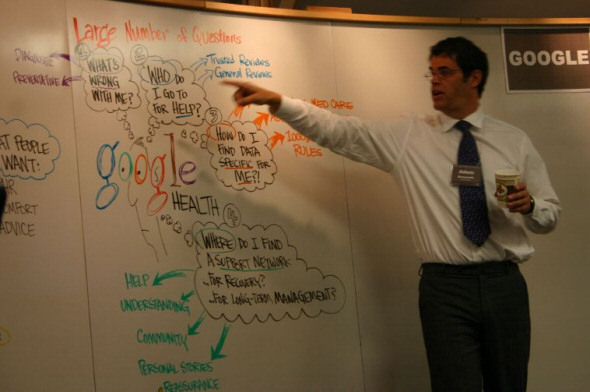 Or is GoogleHealth a tech concern that cannot think beyond tech concerns? Gee whiz. Another great idea for GoogleHealth: the personal health records could easily be programmed (with consent and without patient identification) for epidemic detection and tracking -- in real time! What about collecting data from on a site like this? Here we have a health site that produces a PHR as a side effect of a health service...isn't this the way doctors do it? The freemd.com (as well as any eHealth contact) would have to include the (approximate) location of the patient and enough numbers and distribution of patients for diagnosing and tracking. The advantage of googlehealth or any eHealth patient record is the ability to send out notices--in general, not to specific unless contact allowed. Quite swell for a non-profit (HHS sponsored?) could cover multiple eHealth orgs (google, MS, et al) for bio-surveillance (and drug surveillance). Fat chance. A lot of what Google wants to do has been done. Cerner provideds EMR software for 30%+ of the US health organizations and also has clients in 20 other countries. Cerner provides more than just an EMR, it's a complete automation system, including hardware that integrates with the software to automatically grab results and post them to the EMR. Cerner also owns a MASSIVE drug interaction database that keeps doctors from prescribing medications that could cause problems. If Google were serious/smart - they would join up with Cerner. (and my stock would go up!). Oh, and we've been doing this for 20 years. The intention of google to take care of your surfers is wonderful.But it is not easy for every surfer to key in every medical record correctly. We have developed for 7 years e-VIP and e-Baby programs for more thant 3000 families. All the data are transferred directly from the hospital EMR or HIS to the e-VIP or e-BaBy. We invited our Doctors and senior nurses to be their attending physician and healthcare managers. There are too many doctors in the world and they wish to devoted to pay their attention to the health of the people, but not too many. So Why not you try it? Click to the website,www.show.org.tw and find the e-VIP and e-BaBy. click the demonstration and you'll find it and like it. Well it is nice at times to be vindicated for the efforts that one is undertaking. A really integrated healthspace or healthcare-superhighway. These are some of the terms that we are working with. We have been able to for instance, provide the healthcare patient portal which can receive information from any of the disparate systems that might be existing in the healthcare space. We will be able to provide the patients to be able to view the data from thier visits to, lets say 30 hospitals, running 30 different healthcare systems. We are able to take the details from each of these 30 systems and are able to display to the patient her personal health record, with real time updates of the various lab and radiology results (and images). Gone are the days when best of breed solutions existed to make life an integration nitemare. Instead of working with single-sign on technology, it is better to allow Integrated systems to be implemented in every new installation. The idea of the Patient healthspace would be a great way to get the power to the patients. It's about time a company with some brains brought this healthcare community together. I encourage the use of these technologies. On a separate note, shouldn't Google be hooking up to state immunization programs like Visionary has done? Visionarymed.com has conneced their systems to the Florida Shots program so immunizations are directly uploaded. I wish I could be included in on this project. It's incredibly interesting. Are they looking for Beta PHR users? Speaking as one who has a serious medical problem, and many medications and doctors to keep up with, then having my family spread across the country, I think this looks like a great program! It would be great to give medical profs and family access to my info so I can get feedback from a few areas, but also so that in case something new comes up before I can inform another doctor, he/she could see it on here. There's a lot of negativity regarding this, but if you use it for how it's planned on being used: as a tool to help manage your healthcare- it could be quite helpful. I was wondering if there are any people I can contact regarding Google Health and its new platform. Our healthcare team would like to discuss the benefits of collaborating. If you give your name and area of interest, it would be easier for someone to answer you. So far I'm very disappointed. First it runs poorly in Opera, my current browser. Second, web based data based applications have been around for a long time. I've built a lot of them myself. There is simply no excuse to release, even in Beta, an application that cannot be properly polulated by the input form or completely printed by the print request. I added the results of several tests into the "test results" section. The layout provides for several attributes, among them the normal range. However there is no normal range input on the input form. One can add several results for the same test type taken on different days. However, you cannot print all the results out to see how a particular test changed over time. A most useful capability. I'll suspend my attempt to use it until the next version. Is there someone that I can contact to talk about possibly doing business with Google Health?? FYI: go to www.freedrugcard.us, download a free drug card and save on your prescriptions! The obvious next step is a free EMR for physicians, clinics, emergency departments and hospitals. It's the fastest way to grow the user base, when the product is being promoted by the patient's doctor. Allow each party to decide which information can be automatically shared between the practitioner's and the individuals. Let that information flow seamlessly. I work in a busy emergency department. Our EMR software is absolute crap, and it is the best of three different providers I have been trained and practiced on. Yes this will be a big project, but right now facilities have arcane dos or some proprietary variant based ridiculous garbage. No two systems can talk to another and if you've ever used SQL and you see what these want you to do to get a report written you will hang your head and cry. And we pay TONS of $$ for it, and every time we want it to work right they try to sell us a new 'upgrade' which supposedly will fix it but in fact creates 10 new problems if it works at all. PLease google please!! It's the logical next step!! Check out the HIMSS group on LinkedIn. There are many good EMR/EHR's in use. Some are Free but the best ones are offered on a reasonable web based subscription. No charges should be made for upgrades anymore. It is very difficult to get management to buy in to changing a system. Most of the problems I see in practices who don't like their system is lack of training. Management many times use only a portion of the functions leaving other functions to work poorly, such as incomplete reports. With insurance companies holding back on payments in 2009 and patients facing higher deductibles and copays (lower volume of patients), there isn't much money around for investing in new systems. It would be great if Google or other deep pockets came out with a cost effective system. In fact dependable, fantastic, fact-filled advice in this case. A items Have let down, and that also clearly is valid in this case to boot. Most people consistently can make for a worthwhile read through. How can you show So i am floored? : )#) Cultivate the nice content pieces. What Do You Use Google Docs for? Google Custom Search Blog Hacked?